This feature is only available in FeedDemon Pro. FeedDemon's "My Stream" provides a way to quickly receive and view new articles in your most important feeds. Feeds added to your stream are displayed in a sidebar and checked for updates more often than other feeds, so this a great way to keep up with frequently-updating status feeds such as those from Twitter, Facebook, Gmail, etc. To choose the feeds to include in your stream, click "My Stream" and select "Configure Stream." 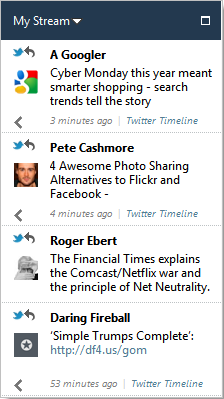 After adding feeds to your stream, it will display all unread articles from the last 24 hours in those feeds, combined with all starred articles in those feeds. Once an article has been read, it will automatically disappear from your stream. If you want to stay informed of new articles in your stream even when FeedDemon is minimized, simply click the white square icon at the top right of your stream to undock it and float it on your Windows desktop. Note: To avoid being overwhelmed, it's recommended that you limit the number of feeds you add to your stream!